New model mid consistency pressure screen is an advanced paper pulp screening equipment in contemporary international world. ZNS Series Mid Consistency Pressure Screen is the new generation paper pulp screening equipment researched and developed by our company by absorbing international advanced technology. ZNS Series Mid Consistency Pressure Screen has benefits of strong adaptability, energy saving, water saving and high production efficiency etc. Mid Consistency Pressure Screen is specially used for coarse and fine screening of various recycled pulp. 1. New model mid consistency pressure screen is mainly used for coarse and fine screening of various waste paper pulp. 2. Many rotor blades, no winding, high efficient and energy-saving rotary rotor. 3. The machine can screen pulp normally under quite high consistency(2.5-4%). It reduces the amount of water cycle and system energy consumption in production process. 4. Heavy impurities discharge pipe makes sure the screen basket runs safely. 5. Advanced structure, sturdy and durable, convenient disassembly and assembly , low energy consumption, less loss of fiber. 6. Easy to operate, less malfunctions for continuous working, less maintenance cost. 7. Automatic oil injection device can reduce maintenance. 8. Seal water flow automatic detection alarm device makes sure the system runs safety. 9. Interlock system ensures the service life of equipment. 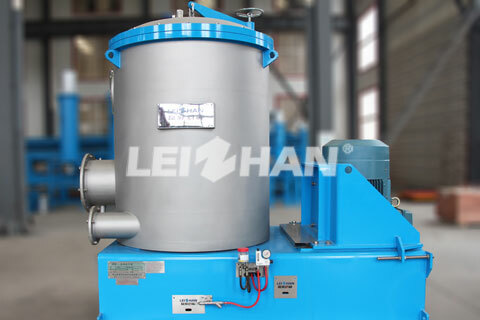 Pressure screen under the rotating function of drum sieve and rotating cylinder and centrifugation effect. The machine will separate the qualified pulp and non-qualified pulp. ZNS Series Mid Consistency Pressure Screen consists of cylinder, cylinder cover, sieve drum, rotary cylinder, base and transmission parts, etc.